Basel III reforms: What will impact banks most? The revised Basel III regulation will increase the quality of the banks buffer and facilitate banks to ease some of their costs on risk. The Basel III reforms intend to better align the output of banks’ internal models and decrease the variance in their outcomes. Within the financial industry, it’s widely understood that the reforms will have a significant impact on banks’ regulatory capital calculation. However, the lack of transparency over banks makes it difficult to ascertain where the reforms will be felt most. Using data provided by the European Banking Authority (EBA), we’d like to share with you some insights on this subject. The Basel III reforms aim to increase the transparency of internal models and of the comparability of banks’ risk capital. The change in supervision, from “advanced banks should use advanced models” to “advanced banks must also be comparable,” should be welcomed. Although the advanced internal ratings-based approach (A-IRB) allowed banks quite a bit of freedom in calculating credit risk, the new foundation IRB (F-IRB) approach could be a blessing in disguise. It allows banks to revolve around risk. The floors in the advanced approach should slow down the cost increase of regulation, because the output floor is also a maximum return to investments in credit risk modeling. Banks can now think of simplifying their model landscape and outsourcing models to improve cost effectiveness. That will be needed in order to compensate for the increased capital claim in the Basel III update. When looking at the impact, we expect Northern European banks to be hit hardest. Simply put, because they make more use of the A-IRB approach that’ll be brought in line with the simpler models. *Société Générale and “La Banque Postale” not included for lack of data. 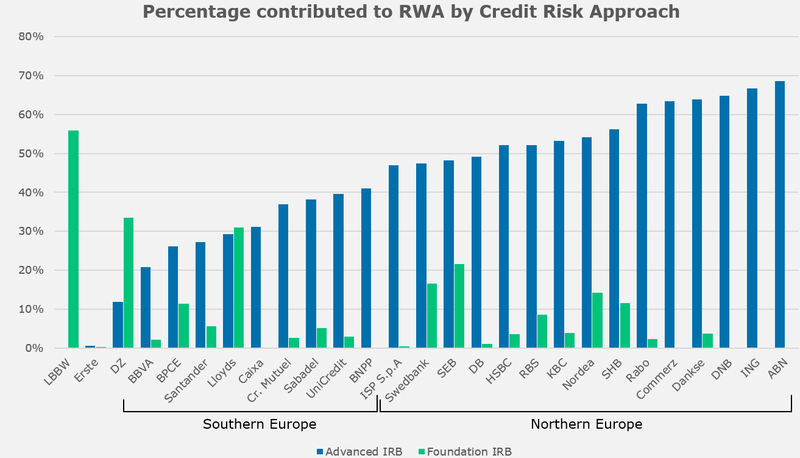 This graph shows the share each modelling approach for credit risk contributes to total RWA for different banks. Banks that use the F-IRB, or standard, approach will undergo less of a change from 2022 onwards, when the transitional agreements for revised Basel III begin. A total of 122 banks from the European Union submitted data about their credit risks to the EBA. Using this data, we’ve highlighted the difference in RWA between the standardized and A-IRB approach, both pre- and post-reform. We observe that banks were able to achieve the best results for their mortgage portfolio from advanced models. Therefore, an output floor that caps the benefits of using an advanced approach for mortgages will have a large impact. We might even see banks that’ll forego their loan assets in homes. 5% increase in risks weights for parameter floors. 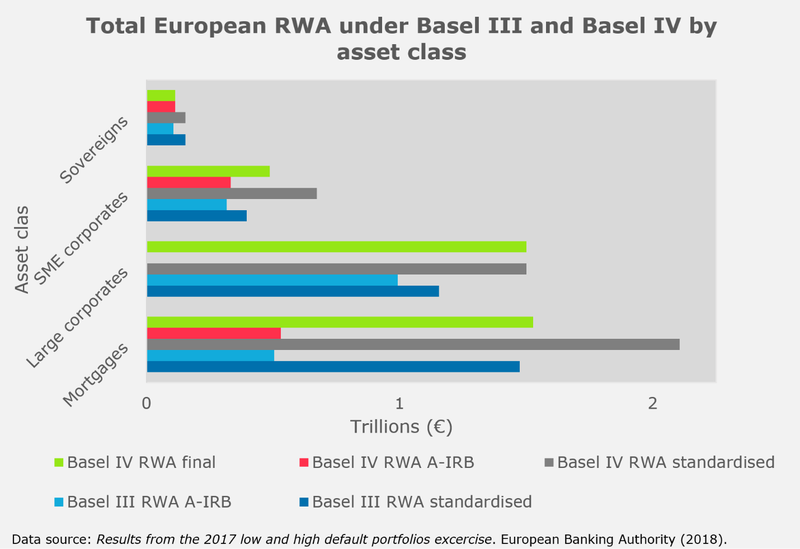 From the EBA data it can be expected that Basel IV’s impact will be the biggest for mortgages (€1.5 trillion change) Therefore, banks with large mortgage portfolios are affected more by Basel IV. The effect on large corporates and SMEs is also significant at €0.8 trillion. This could mean that mortgages and SME loans will become relatively less profitable for banks, because they will be more costly. A trend we already see is banks moving away from these portfolios, leaving the market to informal investors and non-bank institutions. Potentially, this could mean the regulator loses its grip on the market as risks become less measurable and risks for borrowers increase. The graph above shows how much value of a bank’s total assets comes from residential mortgages. Not suprisingly, the banks that benefit most from using the A-IRB approach (i.e., those with high LTV mortgage portfolios) also rank high in this graph. Once again, the Dutch and Scandanivian banks stand out. For market risk, we see a move from value at risk to tail risk. There is a lot of stress testing involved in how they will cover for those unexpected losses. For CVA, two new approaches were introduced to replace the current standard: the basic approach (BA-CVA) and the standardized approach (SA-CVA). The goal is to set capital requirements against changes in the financial standing of the issuer of derivatives, which turns out to be a relevant source of risk. 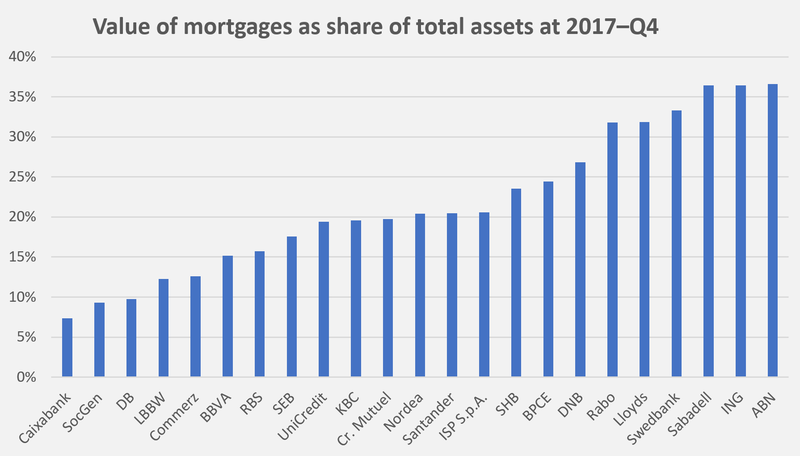 Several European banks have mortgage portfolios with high loan-to-value rates that have historically performed well and account for this fact in their A-IRB models. The more stringent Basel IV regulations may floor those benefits out. European banks are arguing that their American counterparts, who already offload most of their mortgages from their balance sheet to securitization firms Fannie Mae (FNMA) and Freddie Mac (FHLMC), have an unreasonable competitive advantage. We might see a shift towards securitization of mortgages. The revised Basel III regulation will increase the quality of the banks buffer and facilitate banks to ease some of their costs on risk. The intensity of data-driven supervision is increasing, but on the other hand, there will be more specific guidance. 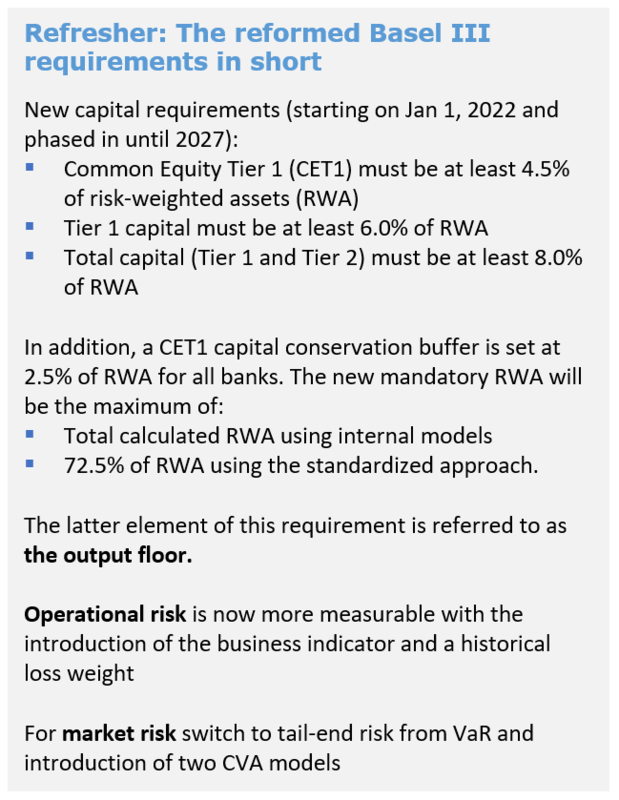 The Basel III update brings an improved level playing field where floors are being set to improve risk comparability among banks. A negative side effect is that banks are moving away from profitable portfolios. On the other hand, other portfolios become more attractive because of the bottomed risk. The transitional arrangements will facilitate banks to have a soft transition. We are happy that the Basel framework is evolved instead of transformed. Because, the idea can emerge that banks can shift their focus from compliance to banking and incorporate their risk management capabilities in business as a transparent manageable part of their value chain.